Hello Wednesday! 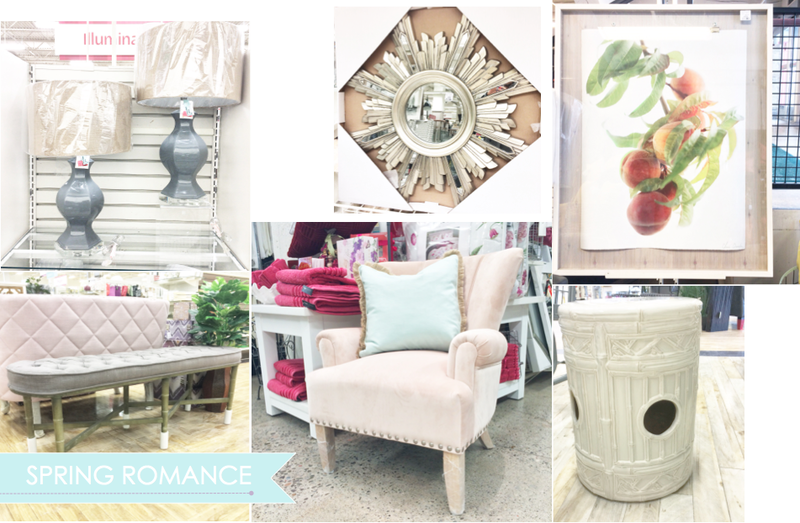 It has been a while since I shared with you my favorites from HomeSense. The truth is I have been battling with tight project deadlines and several cold / flu episodes since I returned from Europe in January. It's hard to believe it's only March and I felt like I have been back forever! Anyway, a friend of mine has just purchased his new condo and was looking for some help in the decorating department. So I visited a couple of my favorite HomeSense locations and wow, the buyers have done good this season! 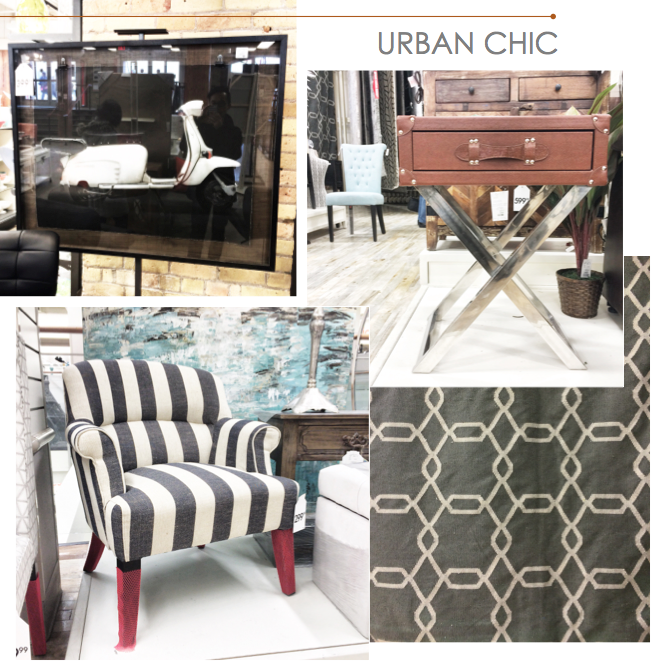 I have put together 3 looks for you today and first up is Urban Chic. Inspired by the eclectic, industrial spaces featured in the magazines, I was drawn to the sharp contrast between the softness of leather and the crisp chrome base of this masculine side table. The super cool moped art had me at hello and all guys love moped right? This classic chair is so chic thanks to the bold black and white stripes and to pull the look together, a geometric motif on this charcoal and cream dhurrie rug. Spring is in the air (only 2 days away!) and I am loving all the pastels at HomeSense. This refreshing look features a gorgeous velvet chair in blush and I simply couldn't resist pairing it with a minty blue linen pillow. I have seen my fair share of ceramic stools but this one knocks it out of the park with a full on faux bamboo outfit for only $70 (exact ones go for 4 to 5 times more online)! The scale and the colors of this peach artwork captured my heart and I am desperately trying to find a home for it. Who doesn't love a sunburst mirror for a hint of Hollywood glam? This one from HomeSense is sensational. If you are looking for a pair of stylish lamps in great scale for less, these two are on clearance for $80 a pair! After the long and extremely cold winter we had this year, I would love to spend my entire summer up at cottage country. 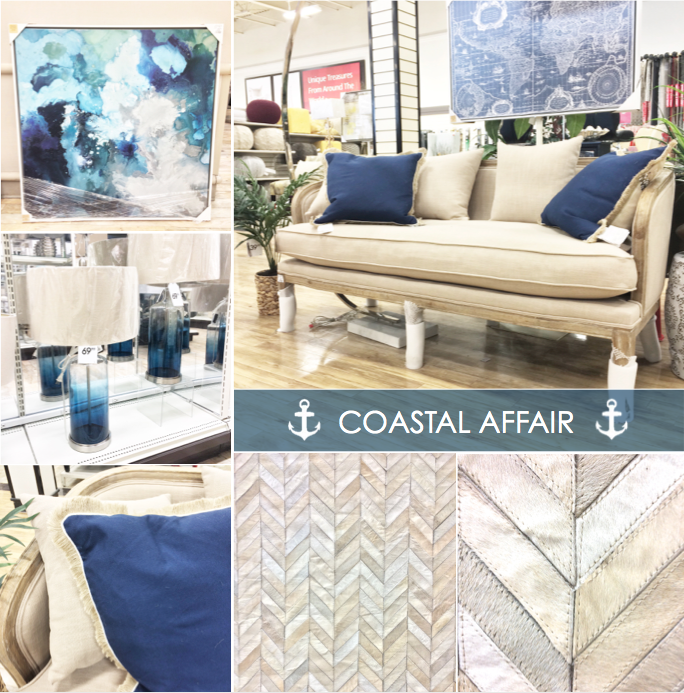 Knowing that's highly unlikely (two full weeks top if I am lucky), this collection of all things nautical with sandy neutrals + navy blue is how I bring summer right inside my home. This settee has got to be one of the most beautiful pieces I have seen at HomeSense. Its casual elegance aesthetic makes it an instant hit on Instagram. The colors and the energy of the artwork reminds me of the many moods of our lakes (calm, stormy, and everything in between) and hello lamps! Let's face it, I love herringbone and may I introduce you to this incredible 5 x 8 rug for $399! Aside from my trips to HomeSense, I was also treasure hunting on the weekend and scored a pair of faux bamboo garden chairs & a couple of throws by Nate Berkus! 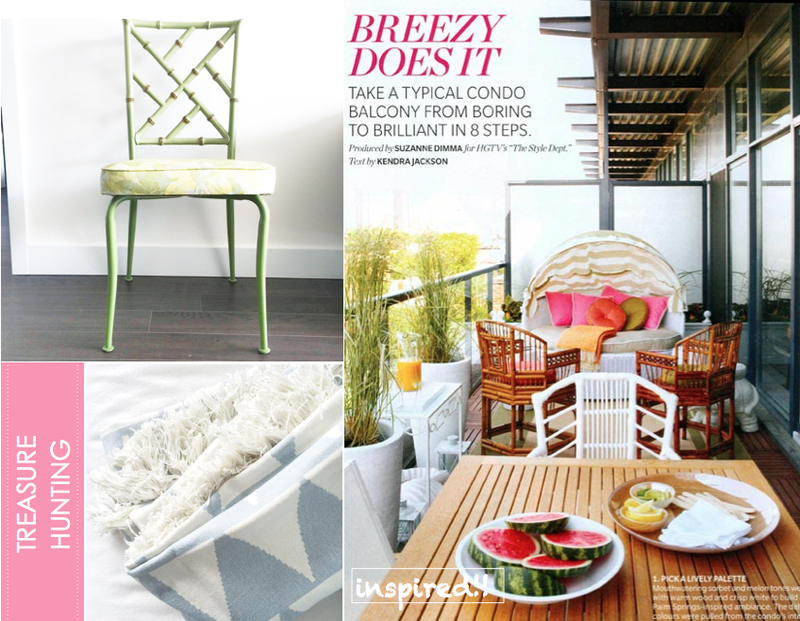 I love the original apple green finish and it reminds me of this colorful, palm beach inspired balcony designed by Suzanne Dimma for HGTV's The Style Dept! Now I just need to figure out how to add coral pink to the space! Have you been out treasure hunting? I would love to hear about your latest finds! I'm glad to see you scored those chairs! I debated buying them, but don't really have a place for them. Love the coastal look, and I'm impressed with the bamboo chair! Super find. which HomeSense location was the moped picture and herringbone rug from? I bet they are gone but don't mind going around hunting them down in Toronto. Hi Mary! I think I saw the moped last week at Spadina and Queen location! The herringbone I don't actually remember where I saw it. Sorry!